Let's face it computing power is increasing exponentially. It used to take hours to rip a CD and encode it to mp3 (we're talkin 10 years ago), now you can rip and encode an album in about 5 minutes, and the bottleneck is the CD-Rom DRIVE. It can't read the CD fast enough to feed the processor. Now that's power. In order to make it super, extra easy to understand I'm breaking this down in to simple easy to understand (but not to ever ever follow) steps. Shiver me timbers, This may be illegal in your country! Then again, since when has that stopped a back stabbin' pirate like you? For Windows there's Magic DVD Ripper, it's not free but hey you can always pirate that too ;) there's plenty of torrents. For Macintosh, I know you would probably rather buy the movies from iTunes anyway, but just in case you're feeling a bit scurvy, or yeller-bellied, there's MacTheRipper to be had. For Linux, DVD::Rip is good and has lots of options to tweak. For a simpler approach, try AcidRip. Ye begins yer journey with soft, ambiguous piracy. Yes you're making a copy (on the computer), but it's for archival purposes, right? This is probably still legal. 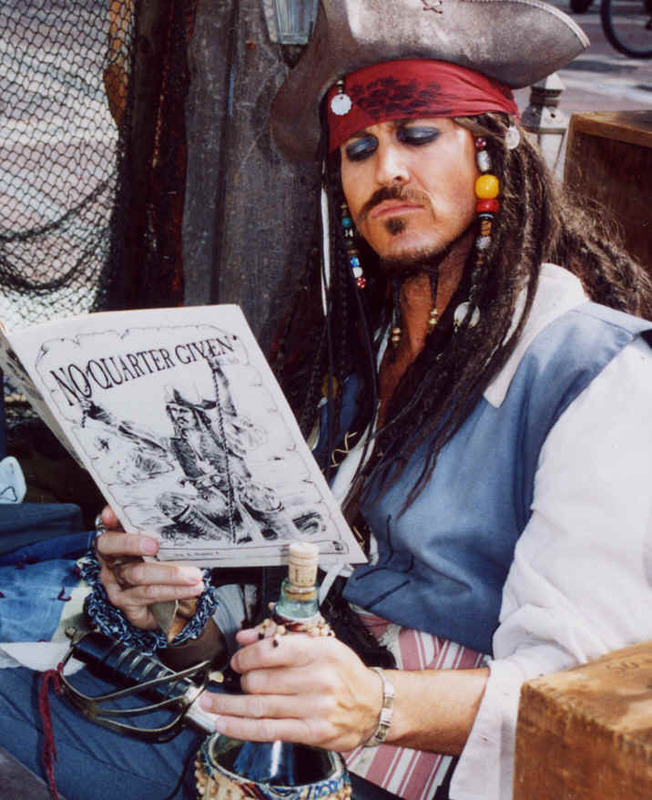 But now that you've got digital copies of all your DVD's, your pirate's hunger intensifies! For $16.99/month ye, the evil video-pirate, may acquire 3 DVD's at any given time. Which is convenient, because it takes about 3 days to get the next DVD from the time you mail one back. That means you can rip a new DVD every day and never miss a day. 30 Titles a month ain't bad (it's only about 50 cents per DVD). When ye use encryption the pirates code is safe (usually). It's not bullet proof but it really is an invasion of privacy if your ISP starts trying to hack the encryption on your internet traffic. Comcast is already being punished for similar offenses. Ye setup a filesharing server! Filezilla has a windows ssh server, which is easier to use. Otherwise there's the original OpenSSH server which runs on EVERYTHING. For yer mates, Filezilla offers ssh (a secure protocol) clients run on any platform. Then WinSCP for Windows, Fugu for Mac, and if they're a linux user, they'll have no problems. While it takes hours to rip a DVD right now, you can rip the data to your hard drive in about 10 min and do the encoding overnight. In the next 5 years though, we're going to see this time cut down just like we did with music. Especially with the parallelize-able nature of video encoding. Each time you double the number of processor cores, you effectively half the time it takes to encode video. The only way the MPAA can fight back is by increasing the resolution of the video. Each time they double the height resolution of the video - which is approx the difference between dvd (480p) and blue ray (1080p) - you need 4 times as long to process it. I think that when the time it takes to rip a movie is 10 minutes or less, is when people will start ripping and swapping video the way they do with music. The MPAA can only hold off the pirates a little longer... I'd say 5 years, 7 at most, and only if blueray catches on as a movie format.